This bright and breezy home features a soothing palette inspired by Caribbean island living; and natural materials abound. 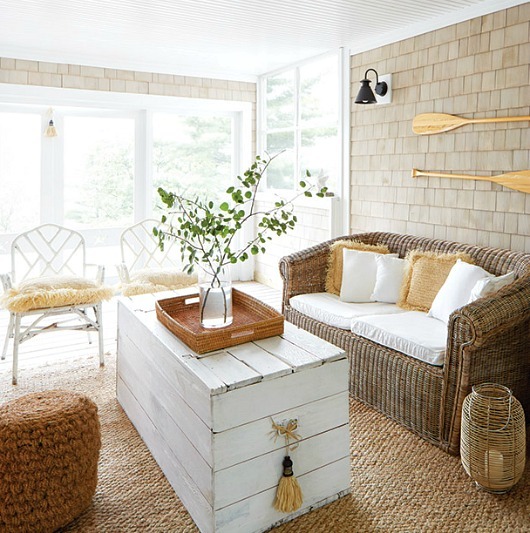 Another home that proves that you can create the feel and look of your most beloved spot by the sea wherever you are. The owners of this home, featured on House & Home, live on a lake in Ontario, Canada. 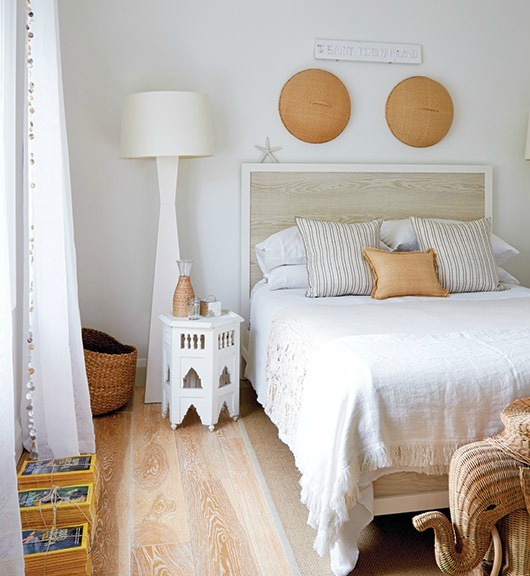 Their home by the lake is decorated in a Caribbean inspired white and wood palette, incorporating natural materials such as jute, rattan and rope. It reminds me of India Hicks' Caribbean Island Home. The sea-themed vignette in the living room features Vintage Charts, found Seashells and coral, and a large Wooden Model Sailboat. Large basket hanging lamps create a great focal point in the dining space, which is anchored on a Sisal Rug with Black Border. Caribbean island style bedroom. The Sheer Curtains with Shells are lovely. And a cozy island-y sitting area on the screened-in porch. In the center, a large white Crate as a Coffee Table. See the rest of this cottage at House & Home.